There are more, in fact you can tune your guitar to any chord you want. The only thing to look out for is applying so much tension to a string that it breaks. Minor chords can be used if the tune is in a minor key. You can simply lower the F# to F in open D to get open D minor, or lower the C# in open A to get open A minor. 'Steel Guitar' usually refers to a way of playing with the guitar laying horizontally on your lap and using a 'steel' rather than a tubular slide. A steel (pictured below) is a hunk of polished steel that you hold in your hand. Slide Guitar, also known as 'bottleneck' guitar, is a very specialized way of playing. 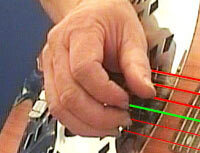 A tube is placed over one of the fingers of the fretting hand, usually the pinkie, and used to slide over the strings to change the pitch of the notes. The tube can be made form a number of materials — glass, brass, ceramic — the traditional one being the neck of a bottle, hence the term 'bottleneck guitar'. Introduced at the turn of the century by blues players, it has become a fairly common way of playing these days and is heard in many genres: rock, pop, country, jazz. Using a slide, of course, allows you to move between any two notes (or chords) with a continuous rise or fall in pitch, rather than in semitone increments. It's a tricky technique because you need to be very accurate about where the slide stops sliding in order to be playing the right note. There is really only one very specific point on the string where the correct pitch can be found, and that point is where the string touches the fretwire in normal playing. So the slide, which is just resting on the strings, needs to wind up directly above the fretwire for any given note to sound right, as in the image to the left. The word 'intonation' is used to describe the 'in-tuneness', and good intonation is a must if you want to play slide. Since there are no fretwires to do the job for you, it comes down to your ear. The traditional way to play slide guitar is to use 'open tunings', which means that you tune the open strings to the notes of a chord. Because the slide can only play notes that line up across the fretboard, it's the easiest way to play chords without all kinds of unwanted notes ringing out. Muting is a way around that problem, and the image to the right shows how I mute. I've just plucked the G string with my index finger; you can see how my thumb is muting the three bass strings and my middle and ring fingertips are muting the two treble strings. This allows the note on the G string to ring out on its own, loud and clear. I play slide in standard or Dropped-D tuning because I really do know my fretboard in standard and I have a pretty good muting technique. I can find all the main flavors of chords in standard tuning too: major, minor, major 7th, minor 7th, sus4 etc., so I prefer to stick to what I know best. Dropped-D is almost standard tuning since I only drop the low E string down to D; the rest are left alone. By staying in standard tuning, I can also play a sort of hybrid style where I combine both normal and slide into one (see the movie above). I find this gives me the best of both worlds and lets me play both styles on one guitar, rather than having one special guitar just for slide. I've listed some open tunings in the column to the left. If you're interested in learning more about playing slide in Standard or Dropped D tunings, check out the DVD I put together a few years ago. I also sell the custom made slides I use, which are machined from solid brass. I've been playing slide for over 30 years and I've tried them all. I've learned that the heavier they are, the better, and that brass is a surface that gives a bright warm tone. I have uploaded many movies of my slide playing at my YouTube Channel.